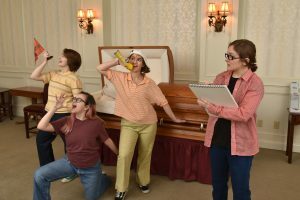 SUNY Oswego's spring musical, "Fun Home," explores the life of cartoonist and graphic novelist Alison Bechdel, who grew up playing in and helping out with the funeral home her father inherited. Here, the adult Bechdel (right) played by Michaela Buckley, observes, sketching memories of the hijinks of Small Alison (center, played by Rachel Leotta) and her brothers, Christian (Eliana Horning) and John (Ajsa Mehmedovic). OSWEGO – SUNY Oswego’s spring musical, “Fun Home,” is a memory play that director and theatre faculty member Jonel Langenfeld likens to a snow globe — one that allows the main character to observe from outside the good, the bad and the ugly of her fraught but loving relationship with her late father. “Fun Home” will take the Waterman Theatre stage at 7:30 p.m. Thursday, April 25, for a preview. 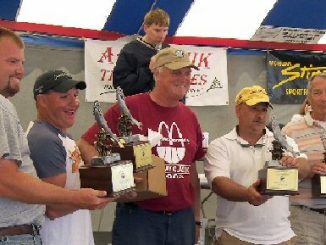 It will run at 7:30 p.m. April 26 and 27 and May 4, with a finale at 2 p.m. Sunday, May 5. The play, winner of the 2015 Best Musical and other Tony Awards during its run on Broadway, was adapted from Alison Bechdel’s 2006 memoir. The graphic novel genre gave the author a therapeutic outlet for a cascade of feelings about her father, as well as her – and his – sexual orientation. Lisa Kron wrote the musical’s book and lyrics, with music by Jeanine Tesori. At SUNY Oswego, music faculty member Alan Martin directs a student orchestra for the songs and frequent underscoring of “Fun Home’s” dialog and action. The musical weaves tragedy and comedy as it follows the shifting snowdrifts of memory, Langenfeld said. The fact that Bechdel is a real person who grew up helping out with and playing in a funeral home (nicknamed the “fun home”) with her siblings makes the snow globe metaphor compelling. Three students play Bechdel: Michaela Buckley appears throughout as the adult Alison, while Rachel Leotta plays Small Alison – about age 9 — and Helena Buttons is college-age Medium Alison. Douglas Woolever plays Alison’s father, Bruce, and Remington appears as her mother, Helen, in the 10-actor cast. The play deals with a father who was a closeted gay man his entire life and his relationship with a daughter who cannot express her own lesbian nature until college, and even then not to her parents until she’s an adult. There are also elements of abuse and mental illness in the play. Small Alison wants to wear clothes usually associated with boys; Bruce insists she wear a barrette — he wants her to be a feminine girl. Though he was abusive to her in some senses, Bechdel saw humor, too, in her childhood. Langenfeld believes the fundamental humanity of the musical would be revelatory for many. Senior theatre major Ryan Benson Smith worked with the “Fun Home” dramaturgy team, which provides research and materials to put the work into context. “All of the characters are real people, so it’s important for us to understand who they were and how they fit into the production,” he said. 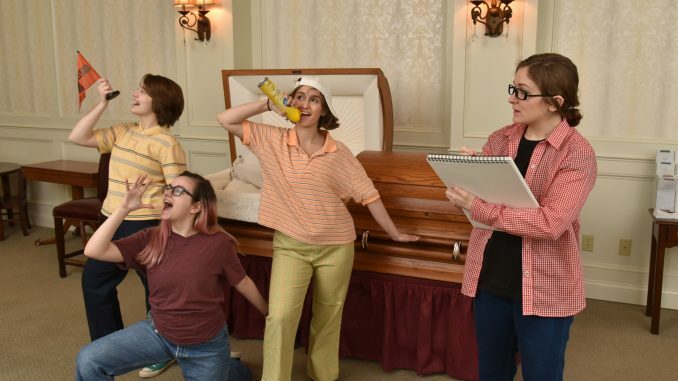 With the LGBTQ and other themes in the play, “it’s very important for us as dramaturgs to make sure everything is presented in the best light.” The dramaturgy hub for the play is online at https://sites.google.com/oswego.edu/funhomehub. The team is developing an educational package so audiences can learn in depth about the show, Smith said. SUNY Oswego junior theatre major Nicole Caroselli, who serves as stage manager, in charge of all of the technical aspects of the production, said the play challenges the student actors to work hard to inhabit the characters, but not to play themselves, even though the themes are broadly — and perhaps specifically — relatable to many families. This is a play of flashbacks, so there are 27 scene changes, Caroselli said, which puts the onus on cast and crew to perfect the positioning of people, costuming, makeup, props, lighting and sound. Tickets for “Fun Home” are $15 ($5 for SUNY Oswego students with valid ID) and are available at SUNY Oswego box offices, online or by calling 315-312-3073. All tickets for the preview are $5. Parking is included in the price of a ticket and is available in the employee lot in front of Culkin Hall and the employee and commuter lots behind Hart and Funnelle residence halls. People with disabilities needing assistance should call 315-312-3073 prior to a performance.